Big News! Title Announcements! Giveaway! Friday! Newsletter going out with big news! There’s an old saying: A new broom sweeps clean. This refers not only to the fact that brooms wear out (especially the old style besoms made of twigs), but also that it is a good idea to replace your brooms every once in a while, since they get worn out energetically as well. 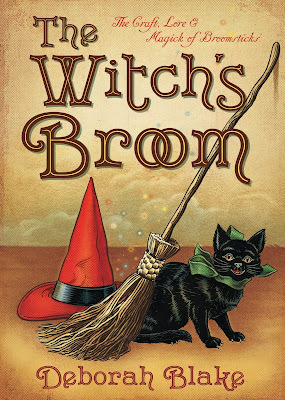 Folk lore tells us that you should never move an old broom to a new house, lest you carry old troubles from one place to another. So it makes a certain amount of sense that even if you don’t get a new place, you might want to consider periodically getting a new broom. No, I don’t have a huge house (it is actually pretty small). The three brooms all have different purposes, and two I hadn’t had to begin with. And one was a gift from a witchy friend. In the way the universe works sometimes, right after I ordered my new ornamental broom, my friend Bobbie gave me a fabulous hand-crafted broom for ceremonial use. (I actually came home on the day I picked up my new car, and found it leaning against my door—two new vehicles in one day!). It was a little ironic that I wrote an entire book on using broomsticks in magickal work, and didn’t actually own one that I used for that purpose. (We’d always used someone else’s when we needed a broom for ritual.) I’d told her I wanted to get one, so this lovely broom showed up as a belated birthday gift! On a more practical level, the lovely handmade broom I used for everyday housecleaning was wearing out, with more broken bristles than whole ones. And since I’ve been doing a major fall clearing and cleansing to prepare for the winter, I figured that made it a good time to get a new household broom as well. I couldn’t find an affordable nice broom, although I’ll keep looking, so for now I just got a regular one from the grocery store. I plan to bless and consecrate it before its first use, however, and apply a little protection oil just to give it an added boost when it cleans. So that’s the story of my three new brooms—each one different, but each one special. Do you have a new broom, or an old one that means something special to you? If not, maybe you’d better go get one! So here is Renee's lovely guest blog (THANKS, RENEE! ), which might just have made me a bit snivelly when I first read it. Do you have a story to share about The Goddess is in the Details? Email me at magicmysticminerva at yahoo and maybe I'll share yours too. I always knew I was something different. I was the one in school who stayed up late writing by candlelight. I felt the energies and the powers of the moon. I was incredibly touched by all things nature. And I flocked to all things spiritual. I knew there had to be a definitive title for who I was, and it was not that I needed it, but because I wanted to go home. All of Life until that point, I was never home. I knew when I found the right 'clique', I would be able to finally be there. After years of flitting around, I found it – my Path and I was immediately welcomed in and comfortable. .The Goddess sang out a song that played right to my heart and my heart answered. It came easy to me, it made sense to me and it just felt this was right for me. After a few years along the Path, I was thinking that I really wanted more. I know that was like looking a gift horse in the mouth, but I felt an evolution of sorts about to take place. We are all a work-in-progress as truth growth does not stop. My world changed one day as I discovered an author, Deborah Blake, at the Barnes and Noble. An infusion of daily life and spiritual life makes for this incredible book – The Goddess Is In the Details. When I first read this years ago, I was in a place spiritually where I needed a total kick in the pants to become involved (and healthier) and this book was the Universe answering me. Deborah breaks the book down each direction your journey is taking you on and then she has suggestions and prompts at the end of each chapter. She is very knowledgeable as she quotes many sources, which gives the reader a more well-rounded opinion. It was not just the lessons and the words she used, it was her complete understanding of so many thoughts and concepts and her ability to break it down in terms that made sense. And I know when things make sense to me, then I am truly home. The Goddess is in the Details moved me then, making it a book I reference often and it moves me now as.her spells and rituals remain quite powerful. I know that for me, when I saw how easy I could state things in my own terms, I reached a whole new plateau and my practice on the Path moved to another level altogether. She reminds the reader that the daily 'mundane' chores can even be spiritual and I love to hear and read that because that is something I have done for a long time. From walking with my Dad when I was younger and finding rocks and such with Obsidian being the first 'crystal' I was into. Whenever I write, I feel I am doing something spiritual. If I clean or do laundry or anything such as that, I remind myself of the good behind having the abilities to do those things. Then I read Deborah saying that daily things can be magical and actually be a method of honor all on their own. Overall emotions that come up when I am reading range from absolute smirky-ness to smiling because some one out there just 'gets it!' I also am proud to be a part of this world, this space and live as who I am and always have been and who I always will be. Part of the joy of Witchy-ness was the spells, the words sent out. As a writer by trade, I began, with inspiration, as lt moved me to pen my own thoughts. Even though I was an established author and writing poetry and other things for over 20 years, spell writing was something different and magical. I loved being able to put the poetic style I had and do it in such a personal way. Deborah's gentle reminders about harming none and the fact that our words are very powerful remained with me. But not in a chastising way, but in a loving way as a well-loved Elder. Reading this book again, I am still loving the 7 beliefs at the heart of being a Witch.They are so well-written and verstatile. (Especially loving words have power, if you could not tell) And a favorite section would be the one on dealing with a crisis. As she shared the various attribute Witches have in their arsenal, I knew I could overcome most anything. The best part about this is that I was able to see that most of what we are put through can be prevented from the smallest of details. Right then and there, I knew I would have to read and re-read all of Blake's stuff. I have always been a Solitary so the chapter on that was one of my favorites. I find comfort and security in Blake's words throughout and I am harnessing that strength and beginning a group of my own (finally). I have come to the realization that no one does anything truly alone. All of us are connected. And we are all meant to compliment one another. In order for me to receive true acceptance in a place I felt lost in, I had to come to the realization that I am a part of something larger. In Blake's words, I find hope, validation and true compassion. Edited to add: And I just received the newsletter – a sequel to this book is officially in the works? I cannot believe it – I have been praying for this forever ;) Deborah, I am honored to know you, read you and have you as a part of my world. Many blessings and love sent out to you and thank you for this opportunity and to all for reading! I am an Eclecitc Spiritualist and a Witch at heart. I write all I can and I love even more. I am an Ordained Minister and a High Priestess. A Crystal Therapist and an Angel Card Reader. I also work with Chakras and I offer intuitive counseling. I began Catch A Falling Star as a place to present my writings and write and over this year it has evolved into a full-blown business as a Spiritual and Holistic place I am proud of. Find out more about me and see my shananigans at http://www.worthcatching.blogspot.com. You can also find Renee on Facebook https://www.facebook.com/authorreneeavard Be sure to tell her I sent you to say hi! Rose, contact me at magicmysticminerva at yahoo and tell me if you already have The Goddess is in the Details, and if so, which other book you'd like, and where to send it! Thanks to everyone for all their lovely comments. You guys make an author very happy. Love, love, love you all! And if you didn't win, don't worry, because I plan to have all sorts of fun contests coming up. PS--My friend Nancy Holzner has a book out today! HELLHOUND is the fifth book in her fabulous "Deadtown" series, and I love these books with a white-hot passion. Be sure and say congrats to her, and if you're in the mood, I'd love it if you would run out and buy a copy. Happy book release day, Nancy! Boy, do I have some news for you guys! I’ve known about some of this for a while, but haven’t been able to share until contracts were finalized, or other such things. As some of you will have seen from the poll above [IT WAS A SECRET HINT! ], if you ask many people which of my existing Llewellyn books is their favorite, a large majority will name The Goddess is in the Details. And to be honest, it has always been my favorite too. The Goddess is in the Details was my 3rd book, and is far and away the best seller of them all. When it went to a 5th printing this year (yay! ), it suddenly occurred to me that I had more to say on the subject of integrating your spiritual beliefs as a Pagan with your everyday life. So I pitched the idea of a follow-up book to Elysia Gallo, my fabulous Llewellyn editor, and she loved it. So I am really happy to announce that I will be writing that book, my 8th for Llewellyn—which will probably come out sometime early in 2015. No name at the moment, because the one I was going to use is too close to another book coming out soon. I’ll keep you posted. I’m really excited, especially since this will probably be my last nonfiction book. Except, that is, for a small project I just agreed to take on for Llewellyn as well. They decided to put out a series of small books on the 8 Sabbats written by various authors (they will probably be sold as “by Llewellyn”). I’m going to be writing the book on Midsummer, and it looks like the series is going to be great fun. Here is the list of books and authors—it’s a great line-up! I’m not sure exactly when these are going to come out, since they aren’t going to be released all at one time, but I promise I will let you know when things get closer. I can’t wait to get a copy of all of them myself! I love these titles—what do you think? All the books will have something like “A Baba Yaga Book” on them, too, so people will know they are part of a series. The first book is finished, except for final tweaks and copy edits, and the second book has been written and is off to Leis Pedersen, my lovely editor at Berkley, who will undoubtedly have a couple (hundred) revision notes for me within the next month or two. So I’m going to be a little busy. But I am a pretty happy author, all the same. Thanks for letting me share my news with you!